Famous people born on DECEMBER 7 are Sagittarius who love being free to do as they please. They have a lot of unoccupied energy. They have a demeanor that is unpremeditated and trustworthy. This is an understatement when it come to them. In that same sense, they don’t always think things through and this could be detrimental to their mental state of mind. Nonetheless, they seem to be full with a passion for people. To see someone in pain hurts them just as much. These people are usually drawn to them and not the other way around. When they commit to a romantic relationship, they do just that. They believe in one-on-one commitments. It is possible that famous celebrities born on December 7 have that spiritual connection that needs little words. This goes for their children as well. Once they have established a bond, this is very easy to achieve. This link is only strengthened by their practices of meditation and a clear mind. They tend to use natural remedies for small illness rather than seek the help of drugs. 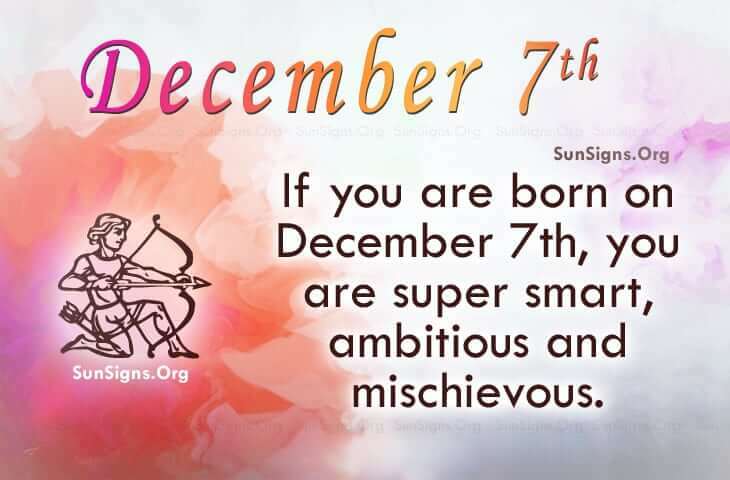 Famous people born on DECEMBER 7th are mischievous Sagittarius. Their childlike attitude makes them a little sensitive as they tend to over think things a bit… okay, a lot! Their friends say they are a little odd. But mostly they’re super smart and ambitious.